Tue, Apr 16, 2019, 10:31 pm SL Time, ColomboPage News Desk, Sri Lanka. 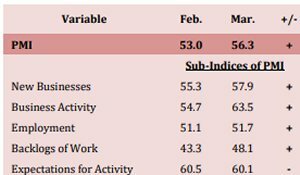 The Manufacturing Sector PMI reached a 46-month high and increased 16.3 index points to 66.9 in March 2019 from 50.6 index points recorded in February 2019. 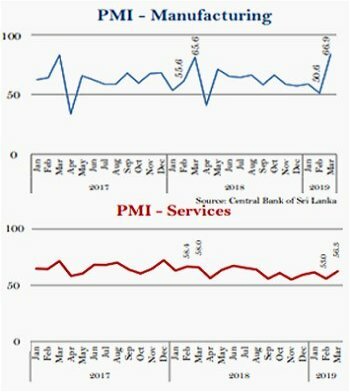 The increase of PMI in March was largely attributed to the increase in New Orders in line with the seasonal demand, especially in manufacturing of food and beverages, the Bank said. The Production also increased significantly, with the intention of achieving expected production levels ahead of the new year holidays in April. The Stock of Purchases and Employment also increased during the month in line with tight production schedules. Most respondents, especially in textile and apparel sector, highlighted that they had to work overtime in order to timely fulfil the orders ahead of festival holidays. Further, lengthening of Suppliers' Delivery Time also contributed positively to the overall increase. 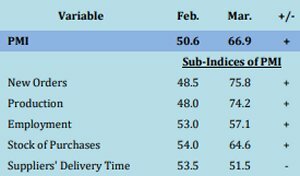 All sub-indices of PMI Manufacturing recorded values above the neutral 50.0 threshold signaling an overall expansion in manufacturing activities in March 2019 compared to February 2019. Services sector expanded at a higher rate in March 2019, underpinned by accelerated expansion in New Businesses, Business Activity and Employment compared to February 2019.
Business Activity sub index followed the usual seasonal upturn and reached three months high in March 2019 contributing significantly to the expansion in Services sector during the period. The expansion in Business Activities was mainly seen across wholesale and retail trade, and transportation sub sectors due to new year festive season. Service providers' outlook on the three months business activities slowed down further in March 2019, as many respondents are taking a wait and see approach. Moreover, business activities of accommodation, food & beverage and other personal services sub sectors are expected to deteriorate since the upcoming period being the off peak season for tourism. Prices Charged in the Services sector increased at a slower rate in March 2019 due to marginal increase in fuel prices, while the expected Labor Cost in the services sector increased at a higher rate due to expected salary increments and incentives to be granted during festive season.